That's a rat, not a mouse. But I can forgive the error since it's a play on the proverb. Extraordinary. Who is taking these photos? Each one is a masterpiece. i wish my cat would be so nice to my sister's pet rat. they fight all the time. I adore cats, especially ones that are sleeping. This pic is SOOOOOOOO cute! Cute blog. Please visit my cat gift blog. It is all about cat gift. Just thought i would say hi from Japan. Doing some blog surfing and found your site. Im looking for some cool styles of bridal gift for my own blog. Theres some really amazing blogs about. if you have time check out my site you will find information on bridal gift. Well when i get my blog running hope you come and check it out. Yup, that's a rat and a pretty one at that. As a rat and mouse owner I'd appreciate the change of name. It's bad enough that rats have such bad reputations that they can't even get credit when it shows what wonderful little pets they can be! 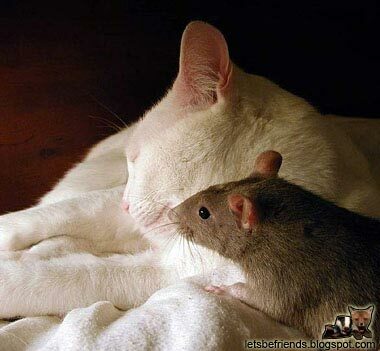 this particular picture was taken by kathy finch of her cat and one of her rats. the cat's name is mylo and the rat's name is baby. she also took a picture of mylo sharing his food with another of her rats which has been shared around the net. kathy's pictures are superb. why do people insist on calling rats mice?!?! This is why the negative rat stereotypes never get challenged. If its evil, mean and scary looking its a rat; if its cute and innocent its a mouse?!?! all i can say awwwwwwwwwwwwwwwwwwwwwwwwwwwwwwwwwwwwwwwwwwwwwwwwwwwwwwwwwwwwwwwwwwwwwwwwwwwwwwwwwwwwwwwwwwwwwwwwwwwwwwwwwwwwwww!!!!!!!!!!!!!!!!!!!!!!!!!!!!!!!!!!!!!!!!!!!!!!!!!!!!!!!!!!!!!!!!!!!!!!!!!!!!!!!!!!!!!!!!!!!!!!!!!!!!!!!!!!!!!!!!!!!!!!!!!!!!!!!!!!!!!!!!!!!!!!!!!!!!!! It looks like the mouse is sneaking up on the cat and the cat as no clue that the mouse is there but when the cat notices shes going to pounce on it and possibally KIILL it. My two rats and I have experienced countless incidents of ratism since I adopted them. Sad thing in the world today. People just can't accept that rats are wonderful creatures and pets, rather than disease-spreading vermin. oiiii <3 What a beautiful rat. They are so lovely pets. The rat and cat one was taken by my friend Katherine. The rat was named Baby and lived almost three years. Her and the cat were not buddies but Katherine caught this shot while Baby was free ranging...And yes,she was as sweet as she looked.Baby never met a human she didn't like. Since cat saliva is deadly to rodents,I'd advise you to keep your rats away from your cat when they free range if they don't get along. if only the rest of our world could be so innocent and sweet!!!! ugggh we should take a lesson from these two! "anonymous at 11:15 a.m." is completely right! 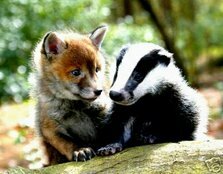 the whole world should learn from these animals!